Monroe, NJ 1/3: Missing subject. Search called off by local police as canine teams were responding. Old Bridge, NJ 5/18: Missing subject. 4 K9 teams deployed. Search called off later in the evening by local PD. Monroe, NJ 5/30: Missing subject. 3 K9 teams deployed. Monroe, NJ 6/11: Missing/evasive subject. 3 K9 teams deployed. Victim located out of state. Warren County, NJ 9/21: Missing/evasive subject. 1 K9 team deployed. Victim located in the morning. Lake Harmony, PA 10/12: Missing subject. 2 K9 teams deployed. Monroe, NJ 11/24: Missing subject. 3 K9 teams deployed. Metuchen, NJ 11/16: Missing subject. One canine team responded. Monroe Township, NJ 10/18: Missing subject. Two canine teams responded. Plainfield Township, NJ 10/6: Missing subject. One canine team responded. Search called off in evening by local police. Subject located out of state. Monroe Township, 9/19: Missing subject. One canine team responded. Delaware Water Gap, 3/28-29/14: Missing subject. Two canine teams responded. Monroe Township, 6/6: Missing subject. Search called off by local police as two canines teams were responding. Monroe Township, 3/22: Local police requested team. One canine team responded. Gillette, Morris County, 5/3: SARCNJ requested assistance. Two canine teams and one support personnel responded. Burlington County, 6/16: Greater Philadelphia requested assistance. Three canine teams responded. Monroe Township, 8/14: Search called off as teams were deploying. Monroe Township, 9/17: One canine team deployed and two canine teams on standby for deployment. Victim found by canine team. Princeton, 9/19: Princeton Fire Department requested assistance for building collapse. One canine team responded. Monroe Township, 10/25: Police department called off search before teams responded. Barnegat Township, 10/27: MARSAR requested assistance to locate missing hunter. Two canine teams and two support personnel responded. Chatham, 11/10: NJSARC requested assistance to located missing 22 year old. Two canine teams and two support personnel responded. NJRRK9 Unit participated in a 3-day training seminar on the techniques of clandestine grave searches and evidence gathering. Donna Hreniuk presented on the use of Cadaver dogs for homicide and related searches. 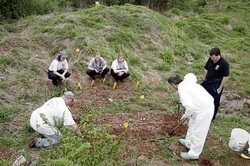 The course was offered by the NJ Somerset County Prosecutor's Office. 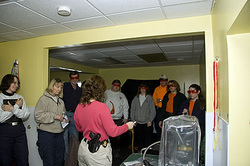 NJRRK9 Unit hosted a crime scene training seminar in early 2009. The seminar was taught by a member of the FBI, Special Agent L. Robinson. On June 23-24, 2012, NJRRK9 Unit hosted a Bob Bailey/Parvene Farhoody seminar. The seminar was geared toward experienced handlers/trainers focused on getting the most out of working dogs. It was a huge success and provided a lot of valuable information. Laura LoPresti and Donna Hreniuk gave a demo and spoke about Search and Rescue to T. Floyd Youth Camp on July 5, 2012. Camp participants learned a bit about how the dogs work and what to do should they get lost.